Todd Bui Wins Event #16: $1,500 Limit 2-7 Triple Draw ($124,510)! When asked about that deficit he had to overcome, Bui had this to say: "In this format, I wasn't too worried. You have to produce a hand. I wasn't trying to move up spots. I came in trying to win and had one goal. I achieved it." Bui is originally from Sacramento, CA and came up learning to play poker with JC Tran. "He's my best friend in poker," said Bui. "We started playing low limits together and then I moved down to Los Angeles because of the poker scene there. 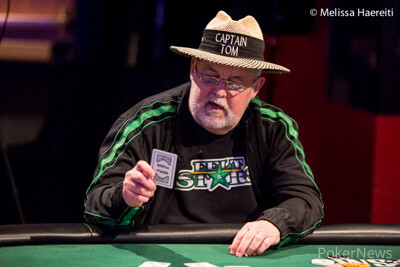 I started with limit hold'em, but branched off into other games." Bui went on to explain that he doesn't play tournaments often. In fact, he said: "This is my first tournament win of any kind." 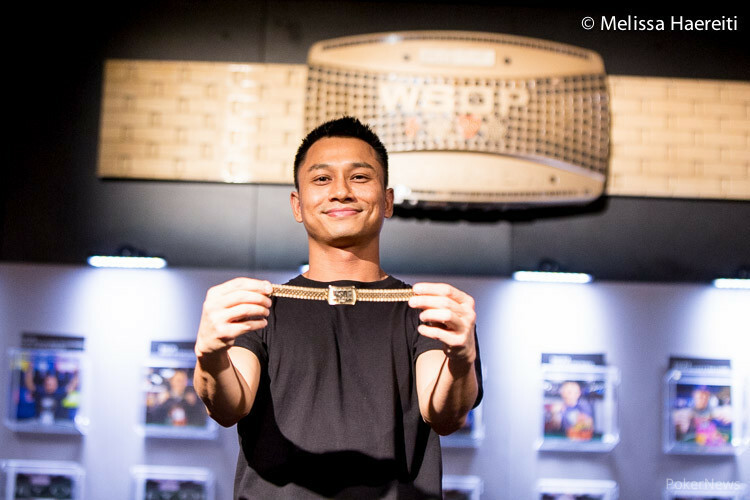 "I said before I came here this year that I was going bracelet hunting," Bui added. "The very next event I played after saying that was this one." To get the victory, Bui had to best a field of 348 players. Among those that would take part in the tournament were notables like Josh Arieh, David Benefield, Ted Forrest, Daniel Negreanu, Justin Bonomo, Phil Galfond, Phil Ivey, Tom Schneider, and Scott Clements. Mike Leah would end with the Day 1 chip lead, and he was joined by players like Jason Mercier, Stephen Chidwick, Todd Brunson, and Dan Smith in moving on to Day 2. At the end of Day 2, only eight players remained and it was eventual runner-up Tom Franklin who held the chip lead. Among those who made the money but came up short of a bracelet were Dan Kelly (35th - $2,767), Brunson (31st - $2,767), Layne Flack (30th - $3,359), Daniel Idema (25th - $3,359), Chidwick (24th - $3,359), Smith (21st - $4,082), and Leah (11th - $6,586). The final table would be a tough one as it contained players like WSOP bracelet winner Aaron Steury (5th - $22,935), one-time $50,000 H.O.R.S.E. runner-up Vladimir Shchemelev (4th - $33,388), and David Bell (3rd - $49,944). Three-handed play between Bell, Franklin, and Bui started with Bui being the shortest of the three stacks, but he would go on a run winning six of seven hands to move into the chip lead. It was a lead he would never relinquish on his way to victory. Thank you for following PokerNews with our coverage of this event and stay tuned the rest of the summer for more exciting WSOP action. Franklin had and would win with any card nine or lower that did not pair him up. He squeezed his cards one at a time and the fifth card was lower than a nine but unfortunately for him it paired him as it was a .
Franklin comes up short in his quest for a 2nd bracelet but will take home a nice consolation prize of $76,943. Inside the Rio All-Suite Hotel & Casino isn't the only place for you to satisfy your World Series of Poker appetite. WSOP.com is the leading online poker site in Nevada and has plenty of action running around the clock, seven days a week. All summer long, a special promotion labeled Multi-Table Madness will be running from 6 p.m. to 11 p.m. PT each night. The promotion will select one random hand at a random cash-game table during those hours that will award every player dealt into the hand with a cash bonus up to $100. What's more is that WSOP.com will be sweetening the prize by giving players as much as $100 more for each additional table they're playing at during the time of the drawing. That means if you're playing in four different cash games when your table is selected, you could walk away with up to $400 in bonus money. For complete information regarding WSOP.com's Multi-Table Madness promotion, please click here. After losing the majority of his chips in a pot to Todd Bui, David Bell would get the rest of them in against Tom Franklin before the draw. Both players would draw two on the first draw and one apiece on the second draw. Franklin stood pat and said "if you can beat a nine you got it" and tabled . Bell squeezed his cards and slid them into the muck, admitting defeat. Bell is eliminated in 3rd place collecting $49,944 for his efforts. We are now heads up with Todd Bui holding a 2:1 chip lead over Tom Franklin. Bell raised from the button and Captian Tom Franklin called from the big blind. Both players drew two, Franklin bet, bell raised, Franklin three-bet, and Bell called. Both players stood pat, Franklin lead, Bell called, and both stood pat again. Franklin lead out, Bell made the call, and Captain Tom turned over for the win. Todd Bui raised on the button and was called by Tom Frankin from the small blind and David Bell in the big blind. They all drew two and Franklin checked. Bell bet and was called by the other two players. Bell and Bui drew two while Franklin took one. Franklin bet and was called by the other two. Franklin stood pat, Bell took two, and Bui one. Franklin checked, Bell checked, and Bui bet. Franklin and Bell both folded and Bui took down the pot. He has half the chips in play now. 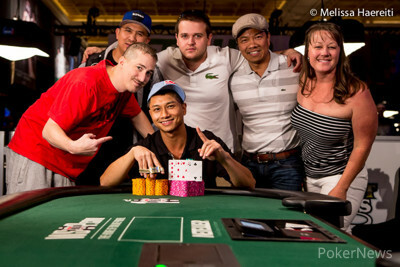 Todd Bui has just won six of the last seven pots to surge from the short stack to the big stack. He's opening up a lot of pots and being very aggressive. It helps to hit hands as well, which he's done several times recently. 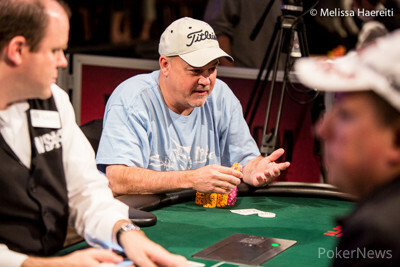 It's still anyone's tournament, however, as one big pot could shift that chip lead back to Tom Franklin or David Bell.